Sporadic incidents of arson were on Monday reported as life in violence-torn Haryana limped back to normal with curfew being lifted gradually and Jat protesters starting to lift blockades after the Bharatiya Janata Party announced setting up of a committee to examine the quota demand of the community. All India Jat Aarakshan Sanghursh Samiti spokesman Ram Bhagat Malik said in Chandigarh that they would hold a meeting later in the day to decide on the future course of action, including lifting of blockades at various places. Normal supply of water to Delhi from Haryana, which had been disrupted due to the Jat stir, is likely to be restored by Monday evening as security forces have taken control of the Munak Canal after evicting Jat protesters, officials said. Curfew, which had been clamped in in towns in view of the volatile situation, was being lifted gradually. Curfew was lifted on Sunday evening from Kaithal and Kalayat while on Monday morning restrictions were withdrawn from Hisar and Hansi and one-hour relaxation was given in worst-affected Rohtak town. The protesters continued to block some roads, including the arterial Delhi-Ambala Highway, demanding a written assurance that the community will be given reservation in the state. The Jats also continued to block some roads including in Rohtak, Hisar and Bhiwani districts. Road traffic on various national and state highways from Hisar to various destinations, including Delhi, Chandigarh, Sirsa, Siwani and Bhiwani remained suspended. Railway traffic from Hissar to various destinations including Delhi, Ludhiana, Bhiwani and Sadulpur also remained suspended. Traffic on Ambala-Pipli route had been restored and State Roadways was also plying buses on the route, but beyond that movement on the Pipli-Karnal-Sonipat-Delhi National Highway was yet to be restored, officials said. After remaining on the edge for several days, normalcy was returning to some cities like Kaithal and officials expect the situation to improve considerably in other affected areas today. However, road blockades were still in place at few places in Rohtak, but the situation is likely to improve during the day, an official said. "But at Maharishi Dayanand University the protesters are still sitting and we hope they will also soon go back to their homes," the official said. Rohtak and other areas had witnessed major damage to public and private property after the Jat protest turned violent. Following the incidents of violence and arson, curfew was imposed in Rohtak, Bhiwani, Jhajjar, Jind, Hissar, Hansi, Sonipat, Kaithal, and Gohana town of Sonipat. Blockades from some national and state highways including Saharanpur-Ambala at Yamunanagar, Paonta Sahib-Yamunanagar, Ambala-Kaithal, Saharanpur-Pipli-Kurukshetra, Zirakpur-Parwanoo and Ladwa-Shahbad were lifted late Sunday evening. Reports pouring from other areas said the road blockades from the Delhi-Panipat National Highway are being cleared for restoration of traffic. According to reports blockades were also lifted in Kurukshetra and Jhajjar areas. To clear the rush of passengers, the Railways would be running a special train from Chandigarh to Delhi at 4pm on Monday. The train would run from Chandigarh to Anand Vihar station in Delhi and it would be diverted from Ambala on to Saharanpur route to reach the national capital since the other route has still not been cleared for rail traffic, a Northern Railways spokesman said. Yielding to pressure from agitating Jats, BJP on Sunday night announced setting up of a five-member committee under a senior central minister to examine the quota demand for the community in government jobs. Union Home Minister Rajnath Singh had said that a committee headed by Union Minister Venkaiah Naidu has been formed to look into the demand for reservation in central government jobs for Jats. 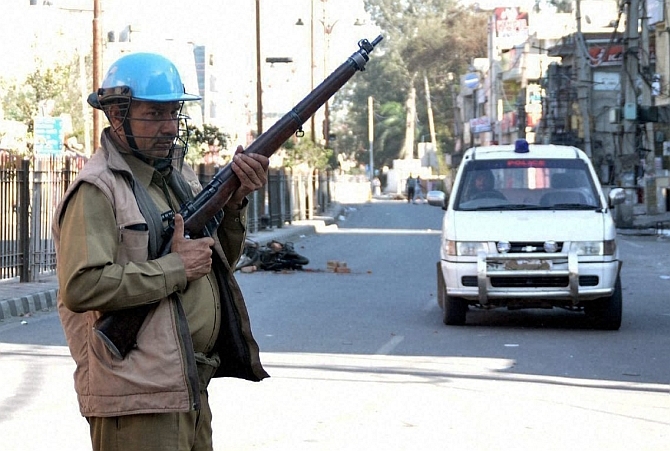 Image: A security personnel stands guard on account of the ongoing Jat protests demanding reservation, in Rohtak.